Topics pertaining to The Key Play itself. Shop at Amazon? There's a one-step way to help TKP out in the process. Swag out with some TKP gear. Midseason TKPC update before the Hokies embark on the final stretch of the 2017 football season. There's a new server in town. Nerd out on some technical details. Join us before Hokies-Tigers kicks off. TKPC progress report before the Hokies' 2017 football season begins. We value your input and responses. The Key Play has multiple opportunities available to cover the Hokies. Turn up to 💯 × 10 The Key Players Club members and support top-flight Virginia Tech Hokies coverage. A midseason progress report of TKP's benefactor group that provides top-flight Virginia Tech coverage and a terrific community of Hokies. The Key Play's annual Virginia Tech football kickoff happy hour is Friday. Become a benefactor of TKP and back top-flight Virginia Tech coverage and a terrific community of Hokies. 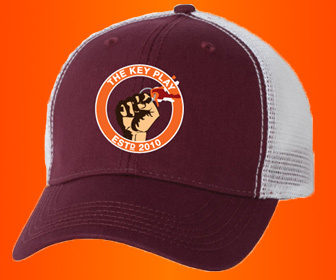 Help support The Key Play; receive a banging TKP keychain bottler opener. The last bit of meta before the start of Virginia Tech's season, Monday. RSVP for the 2015 TKP tailgate! Hello, we still need your help. Upgrade your maroon and orange wardrobe collection and celebrate the Hokies' excellence for putting opposing quarterbacks on the turf.